This year the Olympia Mountaineers is challenging Mountaineers members to spend a day in service to our remarkable public lands. Learn how you can join the challenge, document your service, and play a vital role in caring for our public lands. The Olympia Branch is challenging you to dedicate one day (or more!) to stewarding our public lands. This challenge is a great way to give back to our outdoor playgrounds and meet a vibrant community of volunteers. All Mountaineers members are welcome to join - regardless of branch affiliation. The Pacific Northwest is blessed with many of the most beautiful and accessible parks, forests, and refuges in the nation. Wildfires, severe storms, invasive species, and diseases all pose threats to our public lands - and climate change has magnified these challenges. Public lands are stressed and threatened beyond the capacity of government agencies and nonprofit conservation organizations to repair and restore their health and beauty. Our wild areas need our assistance right now. As Mountaineers, we enjoy thousands of trail and waterway miles throughout our public lands. We must set a compelling example as principled stewards who are willing to work hard to maintain the lands we enjoy. The new Rules of Leave No Trace now go beyond minimizing visitor impacts and focus on leaving the trails better than before. The Olympia Conservation and Stewardship Committee embraces this new concept and is challenging all members to do the same. 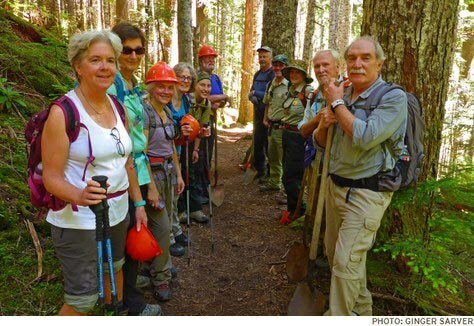 The Olympia Branch, and other Mountaineer Branches, offer a variety of stewardship outings every month. Use the "Stewardship" filter on the "Activities" page to find and sign up for upcoming activities. You can also volunteer with other conservation organizations in the South Sound area. Some of these organizations are listed in the link below. For more information on volunteer opportunities, contact the organization directly or contact the Olympia Mountaineers liaison listed beside each organization. Last - but not least - document your participation! We want to document our hours, so we can track and celebrate our stewardship efforts. If you complete a stewardship activity with The Mountaineers, the trip leader's report will automatically log your hours. In addition, we want to capture all the great work we’re doing with partner organizations (e.g. any non-mountaineer conservation organization, such as the WTA or a local Land Trust). If you complete a stewardship activity with a partner, please submit your hours using the Olympia Branch Stewardship Hours Report Form below. Your volunteer hours can also be put towards your Mountaineers' Stewardship Badge. This badge is awarded to those who complete 8 hours of stewardship through The Mountaineers or a partner organization. If you complete a stewardship day with The Mountaineers, the trip leader's report will award you with your badge. If you complete 8 hours of stewardship with a partner organization, you can receive your badge by logging your hours on the Olympia Branch Stewardship Hours Report Form. What a great job by Olympia's Conservation folks. I have signed up for a day of stewardship in May and intend to rise to this Challenge! Marko, Thanks for your enthusiastic endorsement and participation. Be sure to bring some friend along in May.